I/We have received several personal responses to the previous post, as well as a comment. I/We do not want to incite anyone to anything. We are simply three Sikh women who have decided we want to tell our stories in this forum. This type of thing has happened to many other people, but their stories remain untold. It is our fervent wish that others, many others, would also blog their stories so that when anyone went blog surfing, they would run into us and would not be able to ignore what happened. Unfortunately, it is still not without some personal danger to speak up. But as followers of the Gurus, and especially of Waheguru, we abhor actions done from spite or malice or anger or hatred or fear. Violence is acceptable only to protect oneself or to right a grave injustice, and then, only if all other means have failed. This is how we endeavour to live our lives. However, as they say, those who do not know history are doomed to repeat it. I/We are now going to post SUNI'S STORY, the second part of this account. It takes place during the Battle of Delhi. These two entries are from another personal blog, but we have decided that they belong here, as well. Mai thinks this is just hysteria or an overactive imagination, but I know what I saw. I was about to go into labour with Hope when Mrs. Gandhi was executed and everything fell apart. WE LOOKED HOT in full bana. I'm not sure how, but they even managed to make Mai, wiry and six months pregnant, look like a boy. If we were going down, we were going down in style and with some class. We took some snaps and then put the film down the front of my clothes. Then we sang songs, a really odd variety of kirtans and popular songs, and waited. Then some people came in silently, without opening the door. They were dressed as we were, but they had very long swords. Some men, some women, I don't know how many. I was the only one who reacted to them. I told the others, 'It won't be long now. The shaheeds are here.' They laughed nervously at me, everyone thinking that this pregnant lady had gone nuts. Before long, we heard the mob outside. Guru Ji, properly wrapped had been sitting on his stand. Someone handed him to me and told me to protect him. So to do that and witness everything was my job, since I obviously couldn't fight. They burst in and all hell broke loose. Someone immediately hit Sandeep, Mai's son, from behind with a metal bar, I think breaking his neck. He went down first. As each of us went down,a group of shaheeds went and stood beside him. Some of the shaheeds were surrounding me and giving me protection. Mai has said not to get gruesome, so I'll leave out the details. My poor Mohan knew less about fighting than a child. They killed him next, then Bert, Mai's brother, then Balbir, my son, and Eddie, Mai's brother. Finally, Mai and Mani were the only ones left standing. Then everything stopped. I was not hallucinating and I am not making this up. Mai grew very big and black and her eyes were fire. She and the [male person] who had killed Sandeep were the only ones moving. Even the shaheeds just stood and watched. She calmly walked up to him and cut his throat. The blood spurted out all over her. She threw back her head and laughed. He had a look of terror that you couldn't imagine as he fell at her feet. I am a Sikh and, of course, I don't believe in such things as goddesses, but for that moment, my cousin looked like pictures I have seen of Ma Kali. She became my cousin Mai again and time resumed. What followed looked more like a Chinese martial arts movie than anything that could really happen. Both of them fought unbelievably. You can't imagine it. Finally Mani went down and Mai stood and stared for a moment, then she fell. The others were dead, but she wasn't. They beat her and beat her. Finally they left. The shaheeds stayed gathered around her through all this, but didn't interfere. Several of the shaheeds came over and looked at me holding the Guru and bowed. After a time, Mai sat up and then kind of drug herself toward Mani. I could not believe she was still alive. Then HE groaned. She crawled to him and sat up. The shaheeds withdrew some distance from them. Mani and Mai talked for a while. Then Mani smiled and shouted, slowly and clearly and deliberately, 'Waheguru Ji Ka Khalsa!' The shaheeds all gathered around him. 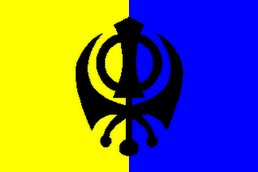 'Waheguru Ji Ki Fateh!' The room lit up and something happened. I have no way to describe it, so I won't try. Then, one by one, they came over and bowed down to Guru Ji and left. Mai did her thing cleaning up the bodies. She got some pictures of the Gurus from me to show them what had happened. She gave the pictures back to me and then collapsed across Mani's body. Shortly thereafter, some people came to rescue us. We can't get their permission to talk about that part, so this will be sketchy. They tried to pull Mai off Mani's body. They thought some sort of reflex kept her gripping him tightly. I know her, though, and I know exactly what was going on. She wasn't going to leave him, no matter what! She knew very well the house would be burnt and she'd burn with it and his body if she didn't get out. Our rescuers could believe she was unconscious; I didn't. I had to convince her to let go. But I was still clutching Guru Ji and still hardly able to walk. All I could do was scream at her that sati was totally unacceptable to a Sikh, even more so to a Khalsa and she had to let go and get out of there! Finally, they pried her loose and carried her and helped me walk out. They took her to safety and I stood nearby, totally numb, still with a tight grip on guru Ji, and watched the house burn, while our rescuers stayed by me for my protection. At least our men's bodies were properly creamated intact and undefiled. I tried to pray, but all I could do was picture some Gurmukhi words. Mai was dead, no heartbeat, no breathing, but they managed to revive her. Some time later we were put on a private plane that eventually landed us in Montreal. Mai was in a coma for four weeks, but, as you know, eventually recovered. I gave birth to Hope in Montreal without incident. Now, please do not try to tell me that I didn't see what I saw! I know what happened to other women in my situation. I was not molested or harmed; the mob seemed to be totally unaware of my presence. The shaheeds protected me and guarded over all of us, believe what you want.That is my story. Mai has promised to post it even though she thinks it didn't happen. And whoever reads this, don't believe those libelous stories that say we were just slaughtered. Some of us fought, and fought well. I know. I was there. I saw it. It has just occurred to me that both of us report manifestations beyond the ordinary in these two stops on the road. I wonder if this is the norm? I think it can't be unusual as we are ordinary Khalsa women (if anyone can actually call any Khalsa ordinary) caught up in these events I have heard vague stories of nihangs appearing and the like during other violent events in Sikh history. Had it not happened to me, I would have found it hard to believe. If anyone else would like to post something similar here, please contact us. Of course, it would be great for you to start your own blog. It's easy to do and the more blogs we have, the greater chance that someone will actually read it. Or if you would be willing to list your relevant website or blog here, we'd love it. These stories are amazing. They are just amazing. I really need to know the truth - are these all real, true stories of your real experience? And if so .. wah.. wow.. I am just speechless.. please continue to write your real experiences. So who is this Mr. MG ? What a blessed family! There is no greater seva in this world than to die for and water this beautiful flower which is the Khalsa with our blood. May Maharaj bless us with this seva. No words can explain what this blog means to the general population, and more importantly what it means to those Sikh women who have went through similar experiences as you fearless women did... With that said, I can’t even attempt to imagine how you are writing these testimonials. Through your words it is obvious you have a special connection with Guru Ji, and Guru Ji has blessed you with the bravery to tell the sangat about the TRUTH of the injustices that were committed during those years. I salute the courage you have showed us by writing your experiences during 1984, and what your family went through. What Mr. Singh has said, there is no greater SEVA in this Panth, but to die for the KHALSA! Mr. MG is someone we know who is totally believing that there is no need for Sikhs to have a place of safety..India now has a Sikh prime minister, a Sikh army head, and that sort of thing could never happen again... It annoyed me enough to start this blog, but he strenuously objected to even his initials being on it. When I saw that ppl are actually reading it, I changed it to this more apprpriate name. I think people have become so conditioned to NOT hearing true stories and also to being cheated many times, that it will be hard for them to truly believe the words on this blog as your actual witness account, your real experience. However, after a few visits they will be completely in tune with the reality and will really appreciate what you are doing. You are giving a voice to the silenced peoples. 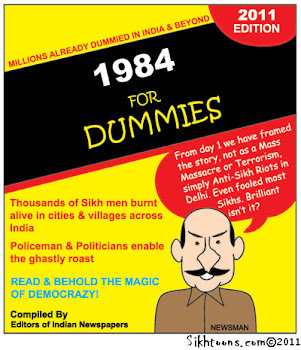 I am not a Sikh and I was born around 1984.But on just reading about 1984,I do not understand how an entire society can attack and kill a community just because someone from that community killed the Prime Minister. ?How can they kill someone who is their friend and subject to such horrendous torture? Forget about me,I am sure many have wondered about this. And I have always been told about 1984 when we had Sikh soldiers who got shaheed and not as victims. I will not forget about you; people like you make this world worth fighting for. I am glad you know that we did fight. Shameful to think that Sikhs could be attacked and we would not fight back! I made a video about the Delhi Pogrom that you might like to see. I wasn't there in 1984 but I hope you didn't have to fight alone.I hope there were at least some people who did not disgrace our society and who stood beside you. And I hope,one day,all the people responsible for this will be punished.